During the holidays, Americans love to send Christmas cards and letters. In fact, we send about 2 billion greeting cards at this time of year. And many of them are affixed with colorful Christmas postage stamps produced by the US Postal Service for the occasion. It’s hard to imagine a time when these festive seasonal stamps didn’t exist. But it really wasn’t that long ago that the US Postal Service created the first holiday stamps in the United States. The first was a Christmas stamp, released in 1962, followed by the first Hanukkah stamp in 1996, and the first Kwanzaa stamp in 1997. But what inspired the postal service to start creating special stamps for holiday letters and cards? They were copying the success of other Christmas stamps. Canada was the first country to issue a stamp for Christmas, although history suggests it was a bit of an accident. In December 1898, Canada issued a 2-cent stamp with the words “XMAS 1898” on it. But the stamp wasn’t originally intended to celebrate the holidays. The stamp honoring Christmas was a result of a misunderstanding. Postmaster William Mulock commented to Queen Victoria that they should release a stamp in November “to honor the Prince.” the postmaster meant the Prince of Wales, who was born in November, but when he saw the displeasure on her face and she asked which prince he was referring to, Mulock reportedly replied, “Why, the Prince of Peace, ma’am”. She agreed to the idea, and when the stamp was issued in December, it had the words “XMAS 1898” at the bottom. The milestone encouraged other countries to issue their own holiday stamps. A few issued some type of Christmas stamp in the 1930s and ’40s (some without holiday images and some to raise money for a specific cause), but it wasn’t until 1943 that Hungary issued the first Christmas-themed stamp sold specifically as an adornment for holiday mail. It was still quite awhile after that before the United States joined the game. In 1958, the postal service issued a Forest Conservation stamp with a deer on it near the holidays, and in 1960, they put out a stamp with a green tree resembling a fir to commemorate the 5th World Forest Congress. Both of these proved very popular due to the release near the holidays. The U.S. Postal Service finally issued its first real Christmas stamp in 1962. 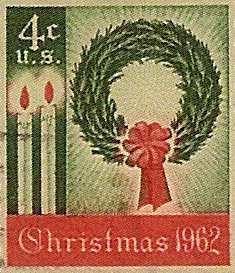 That 4-cent stamp featured a wreath, two candles, and the words “Christmas 1962”. The post office anticipated the first Christmas stamp would be popular, so they ordered 350 million copies of the stamp, the largest number ever produced up until that time for a special stamp. But their projections fell far short of actual demand. When the initial supply ran out, the Bureau of Engraving and Printing had to work around the clock to produce more stamps. By the end of the 1962 holiday season, one billion Christmas stamps were sold. Since then, the US Postal Service has issued new Christmas stamps every year. Now it’s also possible to create your own personalized USPS stamps for the holidays with online services that make it easy to use your own photos and images. So this year, be sure to add some color and style to your holiday mailings with a Christmas stamp!